Combine balsamic vinegar, olive oil, and garlic in a large bowl. 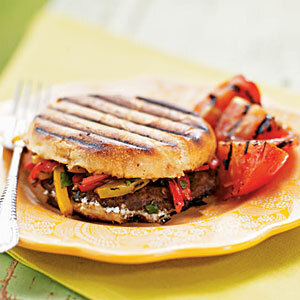 Add bell peppers and portobello mushrooms; toss gently to coat. Remove vegetables from vinegar mixture, and discard vinegar mixture. Place bell peppers and mushrooms on a grill rack coated with cooking spray; grill 4 minutes on each side. Remove vegetables from grill; cool slightly. Cut bell peppers into thin strips. Combine bell peppers, basil, salt, and black pepper in a small bowl. Cut rolls in half horizontally; spread cheese evenly over cut sides of rolls. Arrange 1 mushroom cap on bottom half of each roll; top each serving with about 1/3 cup bell pepper mixture and top half of roll. Place sandwiches on grill rack coated with cooking spray. Place a cast-iron or other heavy skillet on top of sandwiches; press gently to flatten. Grill 3 minutes on each side or until bread is toasted (leave cast-iron skillet on sandwiches while they cook). Kaiser roll? E R I K A – please discuss how to include (or if we should exclude) bread with clean eating. Sometimes I just get so frustrated I RUN fro the bread section (almost in tears). Thanks! Hmmm… sure, we can talk about it. Eat bread. Not with every meal… it’s unnecessary. Not every day… it’s boring.